OLED technology is finally coming home as designers realize its potential for efficient and inexpensive lighting solutions. Resembling a tiny tree blossoming with lucent leaves, Ingo Maurer‘s Early Future lamp is the world’s first lamp to pack energy efficient OLED lighting into a tabletop form factor. Organic light emitting diodes are incredibly energy efficient, long lasting, and can be produced on the cheap as evinced by GE’s recently rolled out OLED printing system. The two-dimensional panels emit broad swathes of diffuse light that is perfect for interior lighting applications, and they can even be rendered in a flexible format. 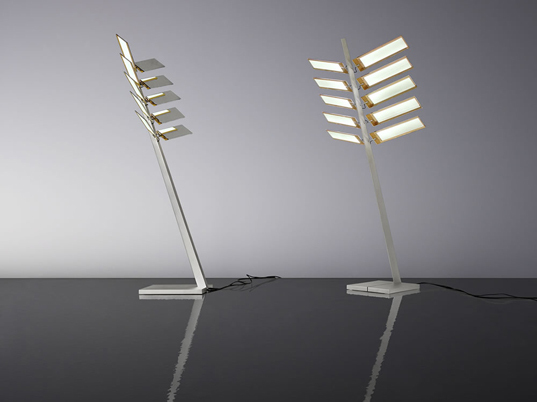 The Early Future lamp is the crowning achievement of Maurer’s artistic innovation and Osram’s team of 50 research engineers dedicated to the development of OLED technology. It features an elegant array of ten small (132 x 33 mm) OLED panels, and Maurer states that it “represents an important stage in the transition from abstract object to functional designer lighting”. The designer’s name and artistic acclaim are bringing to bear a hefty price tag for the lamp, but it’s a striking proof of concept that will hopefully light the way towards future innovations. I would like to see larger lamps. How many watts is this light? What is the light output?